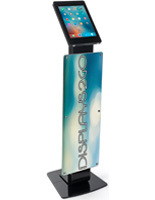 Need a large interactive display that will catch onlookers' attention? 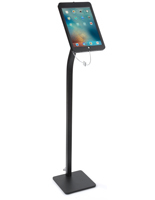 These iPad Pro holders are ideal for attracting prospective customers in retail stores where they can feature digital catalogs and presentations to encourage sales. However, this line of floor and counter enclosures can also be used as cash registers for use by employees or customers. 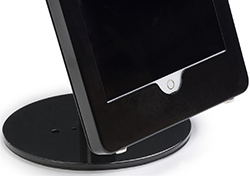 Our iPad Pro holders, or Apple® tablet stands, are made out strong materials for durability in busy environments such as shops, restaurants and malls. 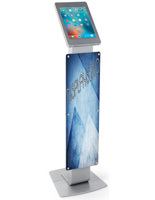 In addition, the kiosks feature a double locking design, preventing theft and tampering of valuable devices. 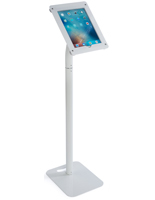 The rotating iPad Pro holders with are ideal for featuring the new, larger touchscreen that will draw in prospective customers from a distance. 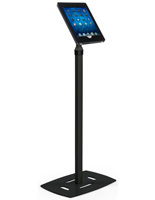 What makes these Apple® tablet stands great as electronic presentation displays? These iPad Pro Holders are offered in two different designs: floor and countertop standing. 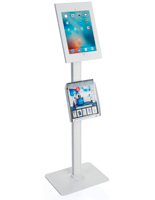 This allows merchandisers and exhibitors to choose how they feature their touchscreens. Countertop Apple® tablet stands make great cash registers when placed on a retail store counter or promotional displays on trade show booths. This type of fixture can also include holes for mounting to surfaces, keeping them bolted down and resistant to theft. Floor standing models can be placed in restaurant waiting areas for showing menus or featuring information in service organizations. 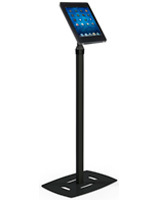 As previously mentioned, each of the iPad holders features a secure double locking design that keeps electronics safe. In addition, each enclosure comes with two key sets for giving access to more personnel. 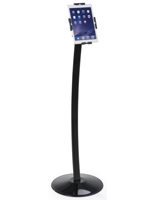 Users don't need to worry about theft and tampering in public areas when using these secure mounts. The fixtures are made of strong aluminum and steel for overall durability as well. 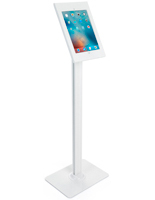 Most touchscreens here have a highly adjustable bracket, tilting and rotating to accommodate any user. 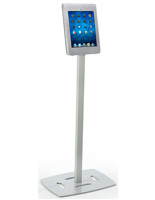 Some floor standing units have an alterable height as well. With their rotating bracket, devices can easily switch between portrait and landscape orientations for working with any app. This line of locking iPad Holders comes with the option of hiding the home button, preventing users from navigating to other apps without opening the case. Models with closed enclosures are best for public use when companies want to keep patrons on a single program. 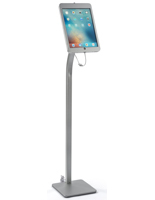 Apple® tablet stands that show the home button are better suited for employees, exhibitors and professionals who require more control when using the devices. 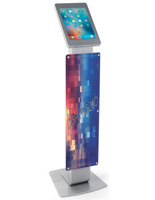 Not all fixtures in this line share the same features, as some come with custom printed artwork on a front panel for increasing promotional space. Fully personalized with full color digitally-printed graphics, any company can feature their logo and branding information. How else can these holders be used? 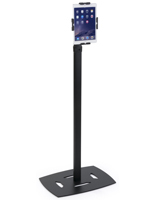 Great for public speaking, the locking kiosks can make presentations easy to read without having any pages to flip through. 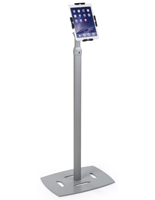 With their professional appearance and neutral black and silver finishes, the holders can assist college lectures, press conferences and other event speeches. 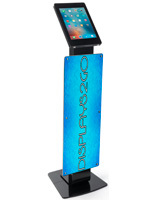 All wares on Podiums2go.com benefit from fast shipping for availability at any upcoming occasion.